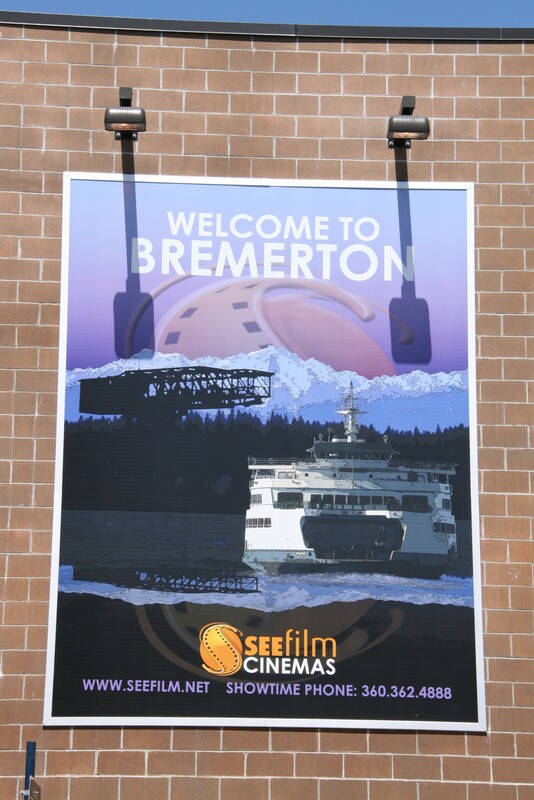 Gretchen Ritter-Lopatowski has seen her share of movies recently at Bremerton’s SEEFilm Cinemas. Like, 20 to 25 of them. When you design the winning entry for a new poster on the cinemas’ exterior, you get to go for free for a year. And bring a friend. And have credit at the snack bar to go with. “We have been fully taking advantage of it,” she said. The graphic designer, who moved here little more than two years ago, was enticed last fall to try her hand at winning the competition. The result (see above) is a lovely collage of Bremerton and theater iconography. Ritter-Lopatowski lives here with her husband Jason, who works at Rice Fergus Miller architects downtown. 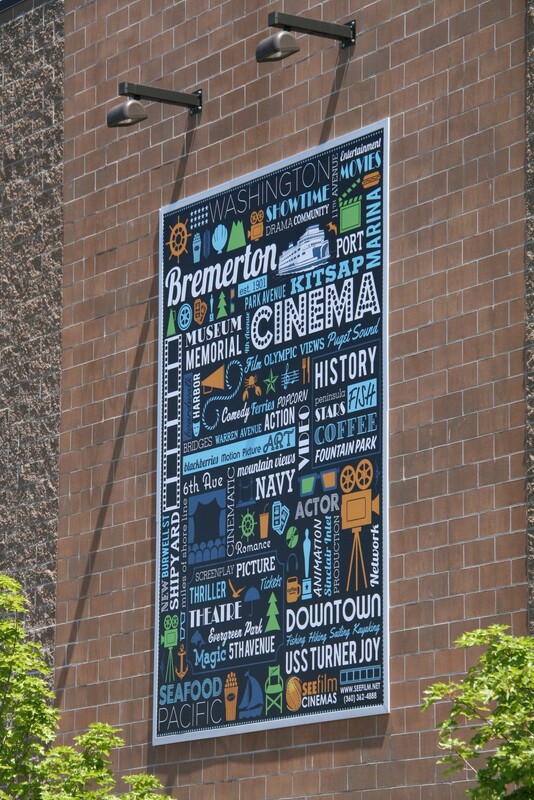 Another poster also went up on the theater, welcoming drivers through Bremerton’s ferry tunnel (also below). It’s the work of Mike Stitt, who with his wife Julie manage the theater. 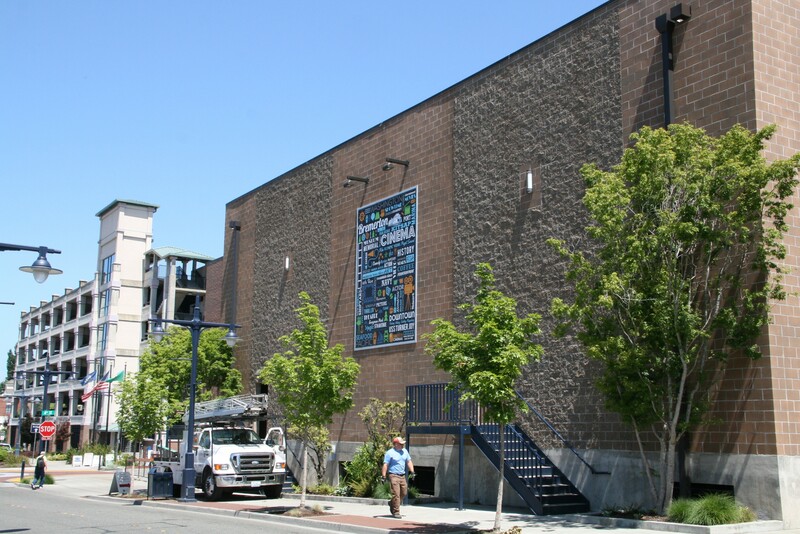 The theater, which opened in June 2012, has continued to grow attendance since it opened. Attendance its first year reached 172,000; now in its third year, it’s likely to eclipse 200,000, according to statistics kept by the City of Bremerton. Does this mean RoboCop is no longer showing?